We are now half way through the Legislative session. In Oregon, the Legislature meets twice in two years. The long session is held for six months during the odd years of a calendar (2017). The short session is held for two months during even years (2018). Thousands of bills are introduced each legislative session, but only a fraction of those will pass the Legislature any given year. I want to highlight a few Bills I have been working on during the first half of the 2017 Oregon Legislative Session. This was a memorial/tribute to Corporal Jessica Ellis who died serving our country in May of 2008 in Iraq, as a Medical Combat. Jessica graduated from Lakeview High School in 2002. She loved being outdoors, running, fishing and spending time with her family and their animals. Jessica served two tours in Iraq as a medic and was given the nickname “Doc Ellis” by her fellow soldiers for her compassion to serve others. During her second tour, Jessica volunteered for a mission and was killed by an IED. To honor Jessica’s legacy of sacrifice and service to our country, the parents have requested a Fallen Hero roadside memorial to be placed along Hwy 140 where she used to run high school track near Lakeview. She gave so much to us all. Freedom is never free. To all those who have served, I thank each one of you for your sacrifice to keep our liberty secure. This Concurrent Resolution was passed in House Chamber and now resides in the Senate to be passed to Governor for final signature. To modernize protections for crime victims, I am proud to Chief-Sponsor this bill to help keep victims of crime safe in our 21st century world of technology. When a police officer collects information from a crime victim their address, telephone number, social security number, date of birth and financial information are kept confidential. However, missing from that list are email address and social media accounts. This leaves open the opportunity of cyber bulling by those who wish to do the victim further harm. HB 3077 closes this loophole and includes email address and social media accounts to the list of items that are kept confidential. It was passed in House Chamber and now resides in the Senate, with two Senators also co-sponoring this bill. I am proud to co-Sponsor this bill with Rep. Mike McLane for the economic success of rural Oregon. It’s great to partner with community leaders to improve Klamath and other counties hit hard by the recession, so that businesses are motivated to build, expand and hire for new jobs. 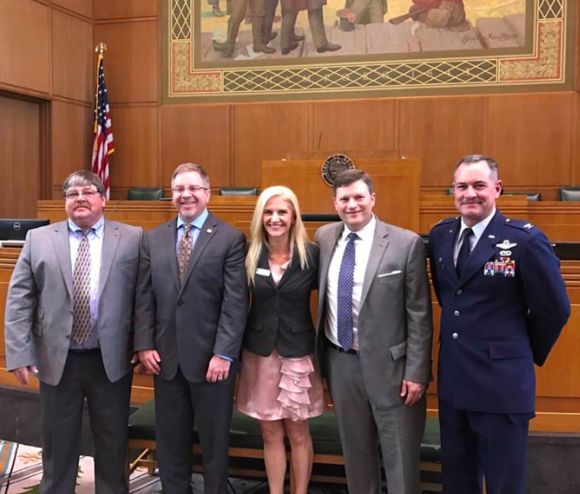 HB 3260 encourages companies working in technology, cyber security and aviation to invest in rural southern Oregon by establishing training partnerships with community colleges and hiring local college graduates. It’s all-around positive for employers to embrace a homegrown workforce in our rural counties. It was my pleasure work and testify on April 4th in front of the Oregon's House Committee on Revenue with Rep. Mike McLane, Klamath County Commissioner Kelley Minty Morris, Col. Jeff Smith and Klamath County Economic Development Association - KCEDA’s Greg O'Sullivan on HB 3206 to give Klamath County another set of economic incentives to attract new business.